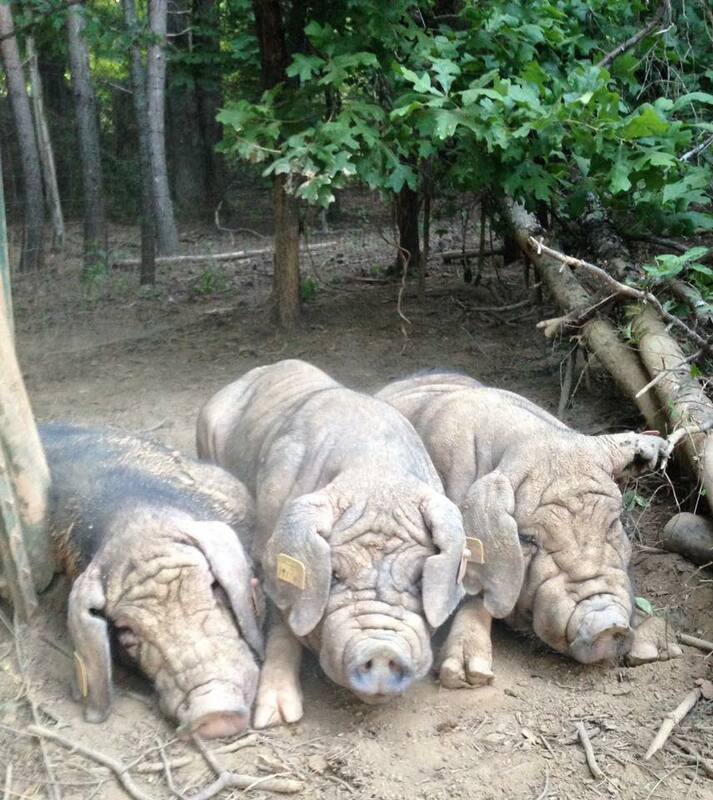 We would like to share with you our actual registered Meishan Pig breeding lineup. We are proud to share their lineage,birth dates and photos .We think all breeders should.All of our stock on the farm are A.M.B.A. Certified Pure Meishan Pigs. All are 100% foundation level stock. Please note: Members of the A.M.B.A. can enter the registration numbers listed into the search function of the A.M.B.A. on line pedigree data base to view the pedigrees of each animal listed here. 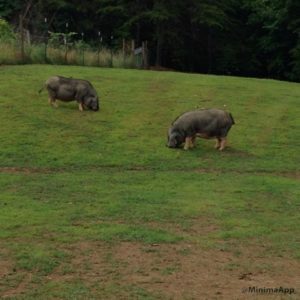 Here at the farm we continually have a number of Meishan Pigs undergoing evaluation for inclusion into our breeding program . 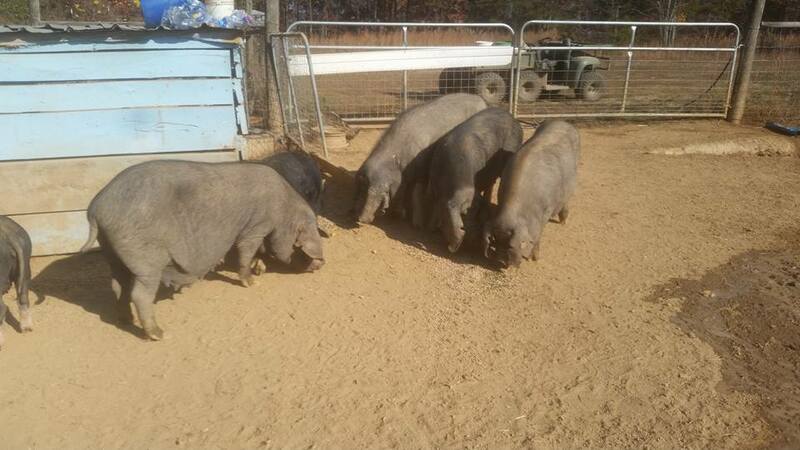 The following pigs constitute our current nucleus breeding herd.Our nucleus herd here at Gods Blessing Farm is the most genetically diverse Meishan Pig breeding herd outside of China. In addition our bloodline diversity assures you of avoiding the pitfalls of undocumented “pure” or highly inbred examples of the breed. We have seen these all too frequently. 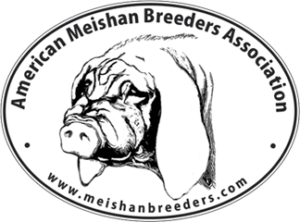 Many “Meishan Pigs” today can be traced to a few exotic animal sale barns and no traceability of lineage,inbreeding or purity is available. 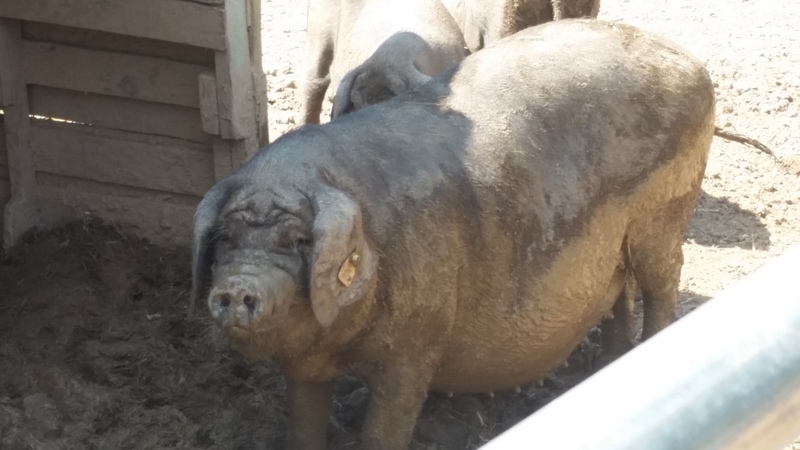 Inbreeding depression express’s itself as small litters , below standard size, poor health and poor growth rates .Unfortunately many of the pigs being promoted as “pure Meishans” exhibit these traits and ultimately make poor foundation stock for livestock breeding programs . We are very proud that our customers have enjoyed excellent growth rates and litter sizes from the progeny of our herd. To date we have seen over 80% double digit litter sizes on first parity farrowings from farms who chose our Meishan Pig bloodlines. This is especially exciting since all research indicates Meishan Pigs begin to hit their peak litter sizes on their third farrowings. Prolificacy or the ability of Meishan Pigs to produce the larger litters of Meishan Piglets is one of the true indications of genetic health of any Meishan Pig herd. 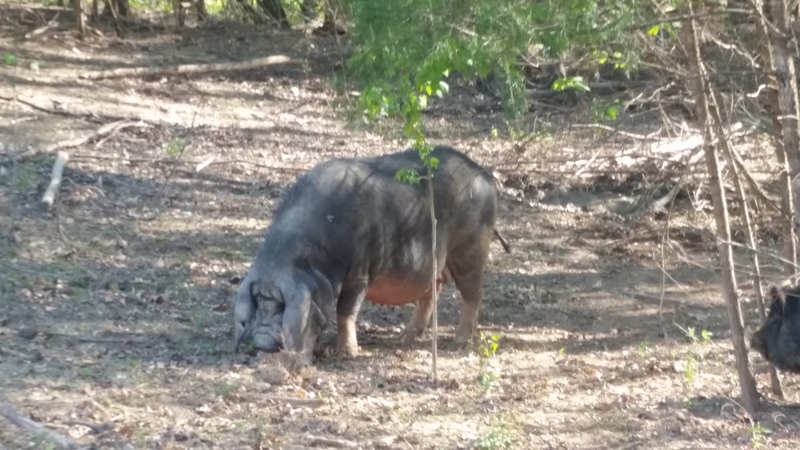 Here on our own farm we have averaged over 11 Meishan Piglets per litter with over 200 Meishan Piglets farrowed from 2016 -2018. Our University of Illinois sow Pink Lady holds the current farm record with a litter of 20 on her second parity farrowing.Our customers have experienced first parity litters of up to 16 Meishan Piglets.With our genetics, which came directly from the USDA Meat Animal Research Center, directly from the University of Illinois and from a farm whose stock came directly from Iowa State’s herd dispersal you are assured of both documented purity, genetic health and genetic diversity unmatched by any other farm. If you are new to Meishan Pigs we can provide one stop shopping for one or multiple breeding pairs.If you currently own or breed Meishan Pigs we can provide you with fresh genetics that will assure you of offspring that will be genetically diverse. Our ability to maintain a closed herd is based on the incredible genetic diversity our boars feature. 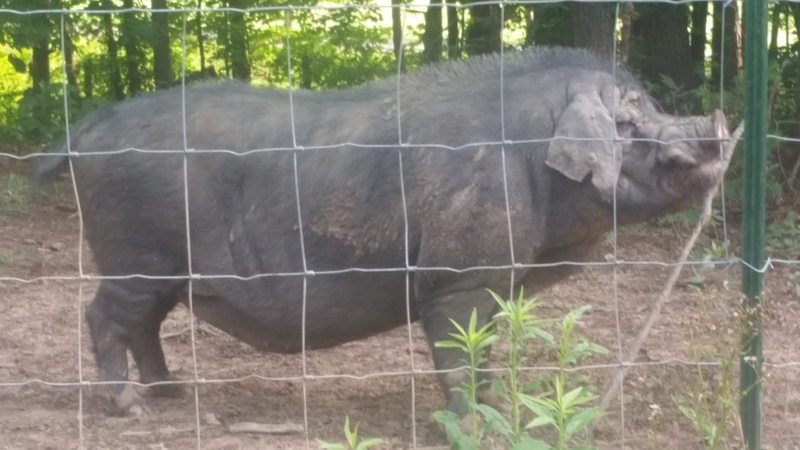 It was early 2016 when we obtained five distinct boar lines from the USDA. In 2015 we had obtained one boar line that was bred from stock derived directly from the Iowa State research herd. 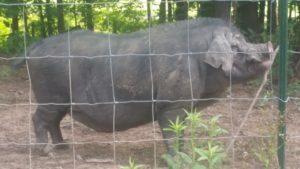 2017 marked the first addition of a boar line to our breeding program that was produced by our own herd. He came from our Iowa State boar and one of our University of Illinois sows.This diversity allows our hogs to exhibit superior structure,prolificacy and growth rates as compared to inbred examples of the breed.All of our original foundation level boars are named after different Chinese Dynasties.They are the cornerstone foundation bloodlines for the future of our Meishan Pig herd. 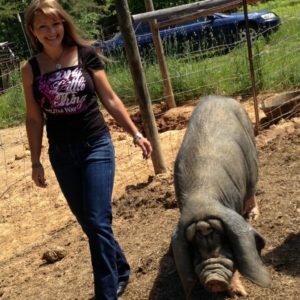 Like any other part of our breeding program boars are evaluated and culled or retained based on rigid criteria . Today we have 5 boars in our nucleus breeding herd which was developed using 7 distinct boar lines. We acquired five genetically distinct boars from the USDA herd at the US Meat Animal Research Center in Clay Nebraska. 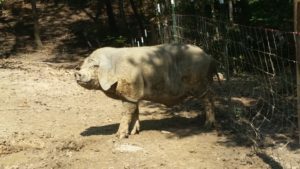 These represented the last boars of that research herd With the entire USDA herd we also have pedigrees back at least three generations. All of our USDA boars were born in the spring of 2015 and should have many years to contribute to our breeding programs. 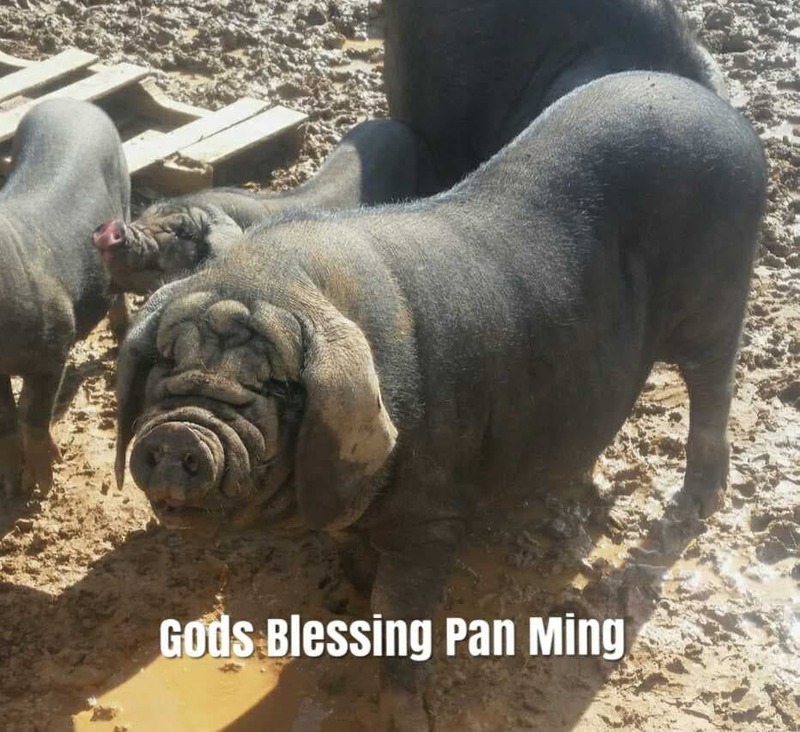 Blocky and stout Ming is one of our favorite boars. He reflects the structure that is the signature look of the USDA bloodline. Ming was farrowed on May 25th 2015 at the USDA Meat Animal Research Center in Clay Center Nebraska and was part of our acquisition of the entire remaining USMARC herd in 2016. 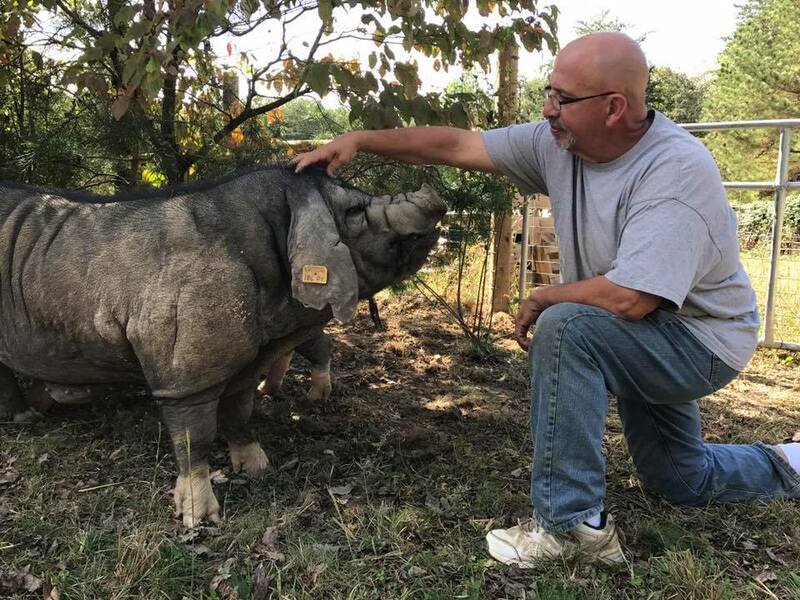 Through an incredible series of events were able to acquire the last Meishans from the University of Illinois Champagne Urbanna Research herd. 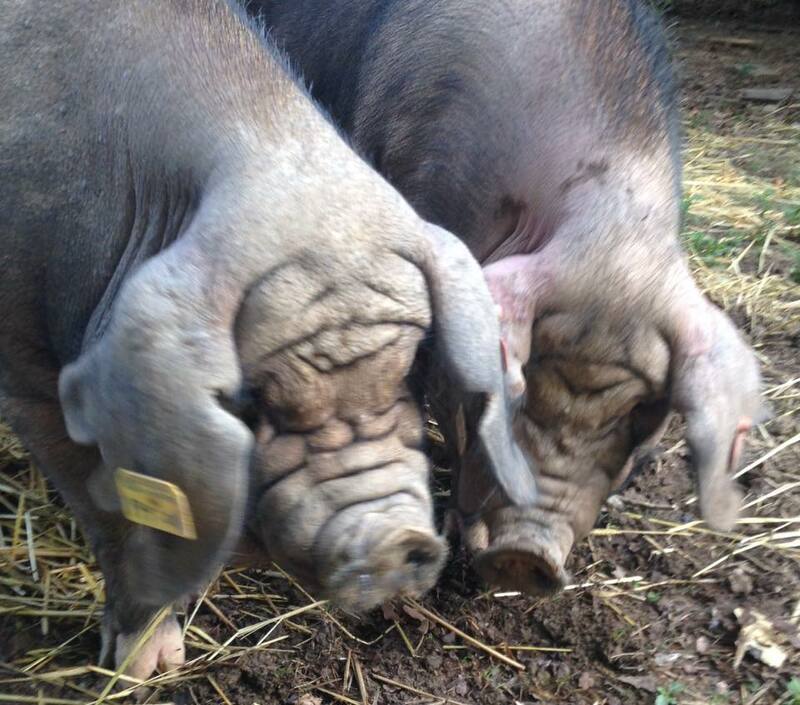 These two ladies (sister gilts) are simply the rarest Meishan bloodline in the US. The Illinois Meishan Pig herd was almost completely gone when were able to bring these ladies home.They were both just over two years old when they arrived here.The Illini girls are larger with better loin length that any of our other certified pure stock.With the most pendulous ears this side of China they are a hit with everyone who sets eyes on them.We hope to use these ladies as the template for our future breeding goals. Panda is amazing.Docile and well built . 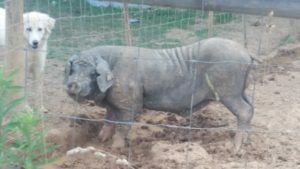 She farrowed some of the fastest growing best examples of the breed in her 2016 and 2017 farrowings of Meishan Piglets. 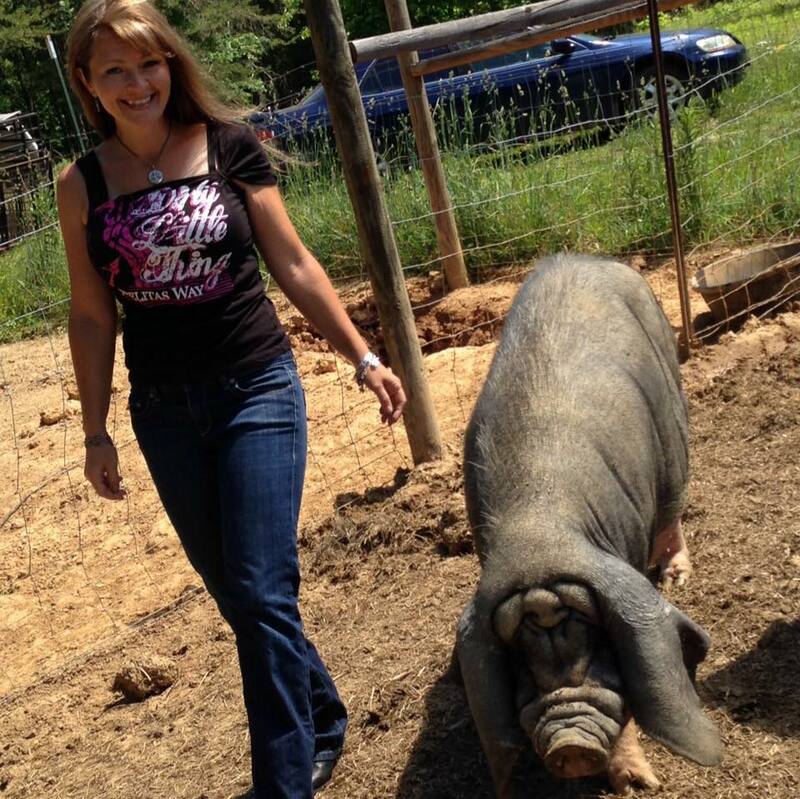 Her daughters have already produced double digit litters of their own. 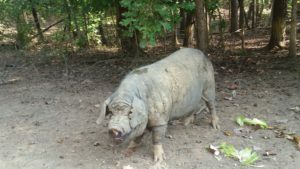 She was farrowed on February 2nd 2014 at the University of Illinois Department of Animal Sciences Swine Facility in Champagne Illinois.She was part of our acquisition of the entire remaining University of Illinois Research herd. Taller than Panda, Pink lady is the largest of our Meishan sows. 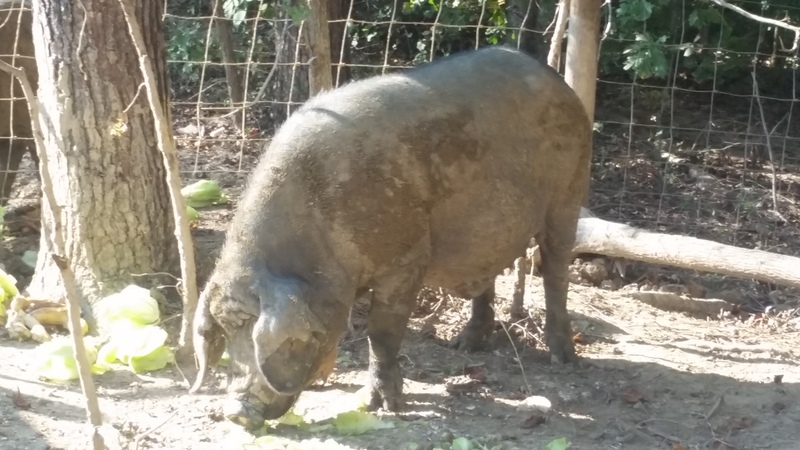 Her initial 2016 parity(usually the smallest for a Meishan Pig) was 12 Meishan piglets.In the spring of 2017 she farrowed 20 Meishan piglets which is the current farm record. We are thrilled with the demonstrated prolificacy of our bloodlines. Her offspring are the basis for new Meishan Pig breeding programs from Maine to Washington State and Montana to Georgia.She was farrowed on February 2nd 2014 at the University of Illinois Department of Animal Sciences Swine Facility in Champagne Illinois.She was part of our acquisition of the entire remaining University of Illinois Research herd. 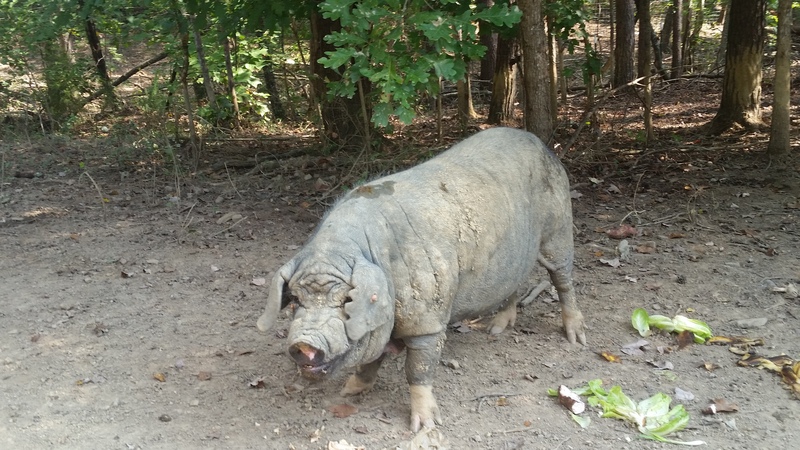 Fu Hao carries the lost Shang genetics.She is a very important and rare pig genetically. Fu Hao is also broader in the loin with exceptional shoulder structure. 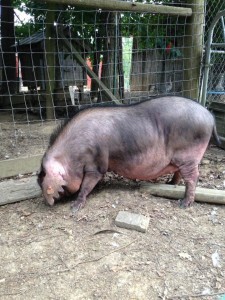 Stocky and blocky she will be a regular in our farrowing rotation moving forward. Farrowed on 02/11/18 Pan Ming is 50% University of Illinois and 50% USDA. The newest gilt to be retained for evaluation she was the pick of the litter from breeding two of our finest Meishan Pigs USDA Ming and Illinois Panda.With great structure ,extra long ears and a blocky wrinkled face she demonstrates what can be attained with the right genetics when breeding Meishan Pigs. She will continue to be evaluated with a 2019 target date for breeding. 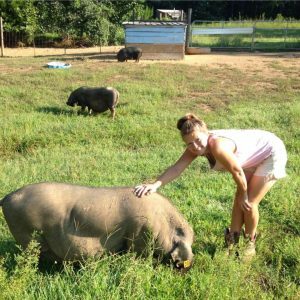 Thank you for reviewing our registered Meishan Pig Nucleus Herd. Please let us know what your breeding objectives are so we can provide you with the best genetic profiles for your farm model. Occasionally as we progress through our breeding schedules a limited number of mature proven sows and boars may be made available. Please let us know if you wish to be placed on a waiting list for these proven animals.